For our series on race timing, we’re taking a look at a popular VTx scanner, the TBS RaceTracker. 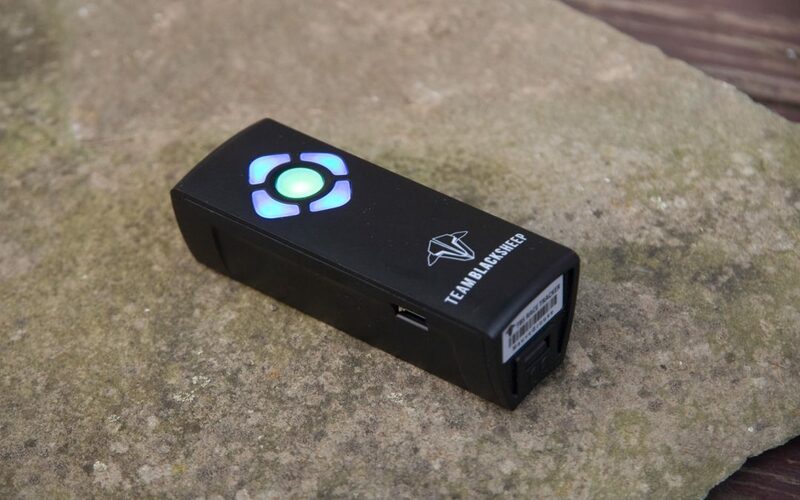 The TBS RaceTracker is sold as a personal lap timer with multi-racer capability. If you haven’t yet read our Lap Timing Guide, you will probably want to check that out before reading this article. That guide covers the basics of lap timing and the various types of systems available, while this one is specific to the RaceTracker product. 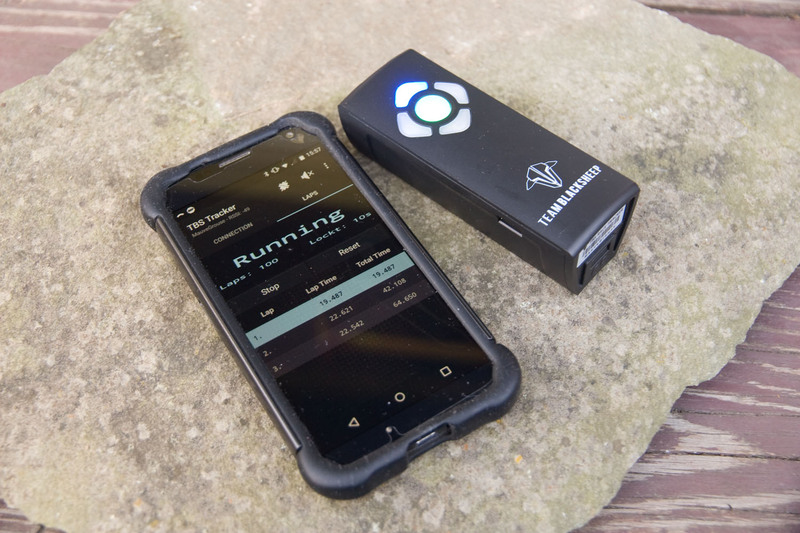 The RaceTracker unit is smaller than the smartphone you will use to connect to it. The RaceTracker is very small. It will fit in a pocket with enough room left for your phone, and it only weighs about 100g. It currently sells for $60. In the box was the unit itself and a connector cable. The cable is for accessories only and isn’t needed unless you’ve also purchased one of TBS’s LED gates. You have to source your own Micro B USB cable for charging—but you probably have a dozen of these already. The’s nothing to install on the quad, which is a nice change compared to IR systems with finicky transmitter units. Each unit contains a single VTx scanner, capable of scanning one frequency at a time. In order to race with multiple pilots, the scanner has to continuously scan one frequency, then switch to the next one and repeat. For each racer you add to the scan, the accuracy drops. At best, the normal accuracy is divided by the number of racers, plus the overhead in switching to a new frequency. There aren’t any hard numbers to work with, but we estimate that if you’re pushing hard on 4S with 4 racers, the RaceTracker may not be able to tell who is ahead unless you are at least 3ft apart. 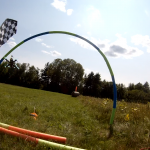 With 8 racers, the system might not even pick up a lap unless it’s calibrated for a 10ft gate or larger. This seems reasonable for informal racing among friends but may not be accurate enough for official standings at a formal event. For more accuracy, placing multiple trackers at the gate is an option. You have to manage each individually, with a separate phone/tablet for each. They won’t talk to each other, either, so a simultaneous start isn’t an option: you can compare total times afterward, but you won’t know who made it to the gate first after the word “go”. Turn it on, drop it on the course, and press “Calibrate”. Setup is a wrap. Setting up the hardware takes very little effort. If you fully charge the battery ahead of time, the RaceTracker should run all day. Turn it on and place it at the gate, making sure your app connects. Place it with the LEDs facing inward to the gate, because the internal battery pack shields the video scanner antenna. The video antenna is non-directional so that it picks up the quad as it’s coming and going. Unlike the Bluetooth antenna, the video antenna is not designed to be upgraded or replaced. You’ll also want to place it where you have line of sight while standing away from the course so the Bluetooth connection works best. You also need to calibrate the scanner. The scanner only recognizes signal strength, so you need to tell it what level to look for. 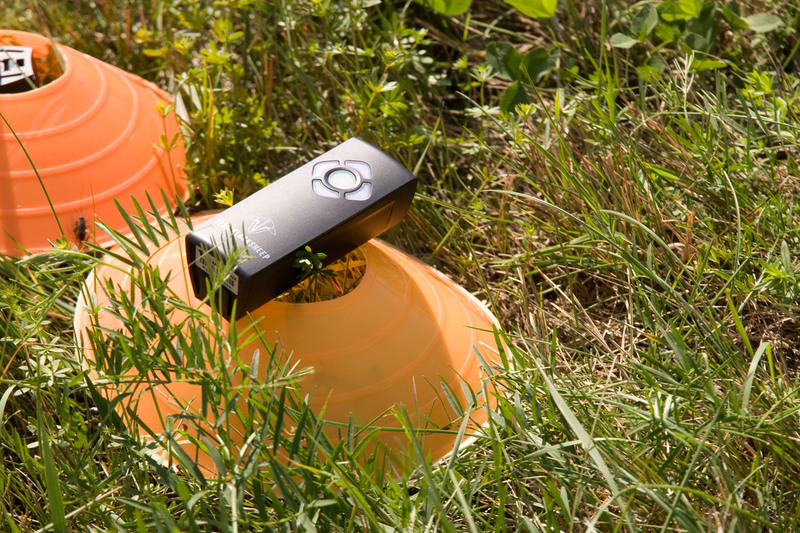 Power on your quad and place it at 1.5× the furthest distance from the tracker that you want to count. When you calibrate here, a quad emitting a signal of the same strength will count, regardless of where it is, physically. It’s best to have all pilots on the same setting. 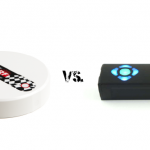 Calibration or using different power levels doesn’t affect the accuracy of the timing, but the Tracker might try to record laps at inappropriate times. If the system is uncalibrated, or pilots use different VTx power levels, it will fool the RaceTracker into thinking quads are closer or further away than they really are—which translates into it marking down too many or too few laps. The RaceTracker communicates with a smartphone or tablet via Bluetooth. This is a pretty short range connection but eliminates the need to run a cable to the start line. Basically, line-of-sight is needed to keep a connection open, and you can’t expect a range greater than about 50ft—much less if your tracker sinks into the grass. A range extender is available to improve this connection and may be necessary if real-time monitoring is important to you. When the tracker does lose connection, it tries to automatically reconnect, but isn’t very successful at it. We found it much faster and more reliable to abort the reconnect and try to start a new connection instead rather than wait for the automatic reconnect. We picked up the range extender mod kit from TBS and upgraded our tracker, and it made a huge difference in being able to keep a connection open. It will still break the connection if you set both the tacker and your phone down in grass at 50ft apart, but it holds it much better. Times are stored in internal memory and sent to the app as they come in. 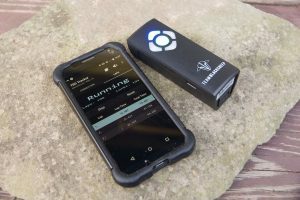 If the app loses connection, the RaceTracker keeps right on collecting data and will sync up once a connection is re-established. The means it’s possible to start a race, then walk away and intentionally lose the connection if you need to place it in a spot that’s challenging for Bluetooth. When you return, the app will download the available data—but plan to spend a full minute or two waiting for it to come across. The TBS Tracker app is provided by TBS to interface with your phone or tablet. For now, it’s Android only and as of this writing, multiple pilot support is only available in the beta version of the app, which you can get by joining the beta program. We’re reviewing the beta version since we’re expressly interested in multi-racer support. The App is laid out nicely and clearly labeled. Setting up racers is fairly simple. First you choose a primary frequency for the first racer. This is the one the tracker will scan when you calibrate. You can then add other pilots, which brings up a band/channel selection box. We like that the actual frequency is printed here instead of just the band/channel designation so you can confirm that it matches your equipment. Remember to remove racers who aren’t flying so the system isn’t scanning unnecessarily. There aren’t many options for race structure: maximum number of laps and lock time. The tracker will ignore laps below the “lock time” and stop recording after the maximum number has been reached. When you start the timer, you have to make one additional choice about race structure: a shotgun start or a flyover start. The shotgun start gives you a short countdown and begins the timer. It’s too bad this isn’t adjustable, as it’s usually not enough time to get far enough away from the tracker, plus get your goggles on, sit down, and get settled to start flying. The flyover start solves this, as timing begins when the first pilot reaches the gate. 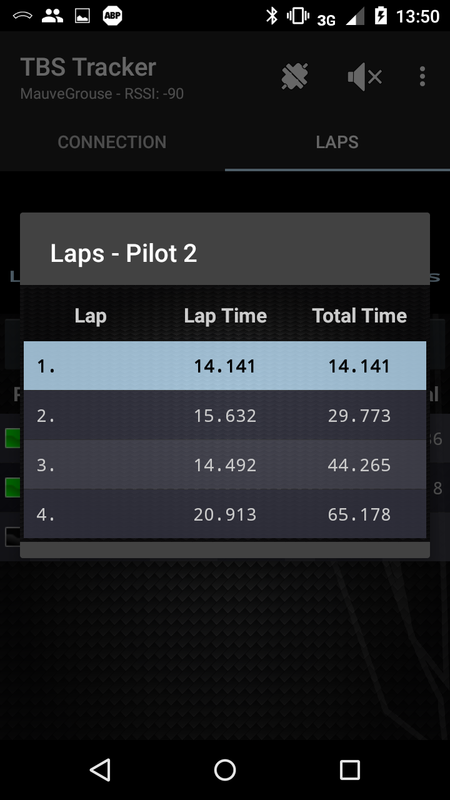 After the race, you can review the standings along with individual lap times for each pilot. Pilots aren’t named so you have to remember which person was flying under each frequency. One huge downside to the TBS Tracker app is a lack of saved race history. Once you start a new race, old race data is lost forever. The App doesn’t have a method to export the data, either. If you want to run an event, you need to record the information manually—copy it down elsewhere, or capture screenshots before resetting the data. We hope the app will be updated at a later date to fix this. 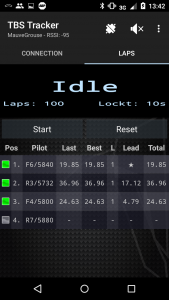 During a race event, we successfully used the TBS Tracker app to time race heats. Let everyone know what power VTx is expected. We don’t allow any VTx above 250mW. We chose 200mW as our target; all but one pilot were able to use it; he could only use 25mW. Calibrate the RaceTracker to the size of the gate. We calibrated a bit larger than needed in order to give the pilot on 25mW the best chance of being picked up. Enter the frequencies being used for the next race heat. This is a tedious task between each heat when your racers are on many different frequencies. You can simplify this process by setting up standard frequencies and have the racers match them, but that can complicate frequency management elsewhere and opens up an opportunity for mistakes. Start a race in flyover mode. You can walk onto the course to do this, and then walk away even if the Bluetooth signal from the ready area is bad. The tracker will run fine without the Bluetooth connection. Call your race start as you see fit. We like to use an air horn. When the race is over, walk back onto the course if needed to regain the Bluetooth signal and let it download the laps. 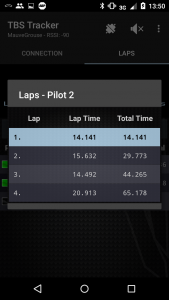 Take screen captures of the standings and each racer’s times, then clear the lap data and go back to setting up frequencies for the next heat. The apps biggest issue is responsiveness. You’ll do a lot of waiting between operations. Sometimes the wait was only a short time, but often we were left wondering if the app had quit working and occasionally did force quit and restart. Each change you make to settings is sent to the tracker separately instead of batched together. When you add pilots, you have to wait for each pilot to be sent to the tracker and receive a response before adding another one. When you want to clear the race details, it sends a command to the tracker and waits for it to send a response back to the app. These all contribute to the unresponsive feel of the app, and is especially frustrating when you are trying to make changes quickly. When racers are sitting on the blocks with transmitters overheating, you do not have the time to wait 5 seconds between every button press. We’ve scrapped timing from several races because of these delays. It would be much nicer if the app collected your configuration input without delay and sent it all at once. A second app that supports the RaceTracker is Drone Squad. Currently, if you’re on iOS, Drone Squad is your only option. We’ve looked at Drone Squad before; it’s an event management app, primarily. To be honest, we didn’t spend nearly as much time with the Drone Squad App while looking at the RaceTracker. 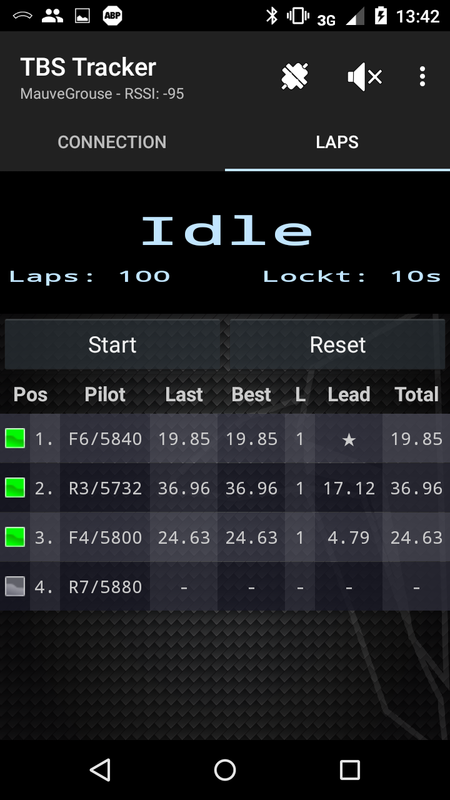 It looks like Drone Squad addresses some of the shortcomings of the RaceTracker app, such as keeping race history. However, there is one huge issue that made it impossible to use: the app must have an active internet connection to function. This is a killer for us. Some of our race locations don’t have good cell coverage, and none have WiFi. It’s impossible to set up many tablets to run Drone Squad out at the field, and a tablet is best if you are displaying the collected times to the racers. Quite simply, Drone Squad is useless for field timing for our group as long as this restriction exists. While an active connection is understandable for the many social aspects of the app, we hope that Drone Squad will make the RaceTracker portion available without the internet requirement. As part of a timing system for a group event, there are some definite shortcomings that stand out. The unresponsiveness and delays in reconnecting with are annoying and extend the time between race heats. 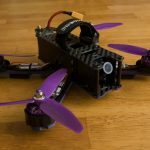 Having all racers use the same VTx power level is difficult (taking into account equipment differences, but also antennas and signal loss to couplers and the like). The system is mostly reliable, but we still had occasional dropped heats when the app didn’t start recording or didn’t clear the last race’s data before recording. The Bluetooth connection range is short and the range extender mod is pretty much required—we really feel the SMA connector and dipole should just be standard equipment. To be fair, the RaceTracker isn’t designed as an event system. TBS sells the EventTracker for that instead—a heady $1000 system which is essentially 8 RaceTrackers bundled together. We really like the TBS RaceTracker; it’s really well designed and has good accuracy. It’s extremely portable, easy to set up, easy to use, and the price beats out Immersion’s LapRF system by 40%. As a personal lap timer, or one for informal practice days among friends, it’s our current recommended method for lap timing. For local community race groups, we’re still searching for our ideal solution. 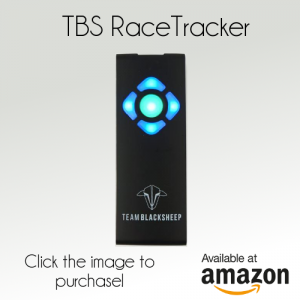 You can get the TBS RaceTracker at Team Blacksheep’s site or Amazon.